These soft and fluffy chicks feel a little bit funny! 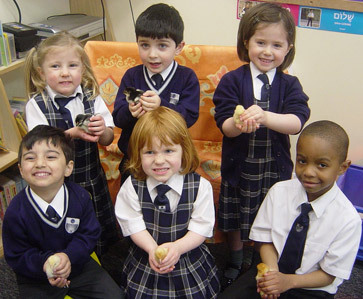 Rose Court pupils proudly show off some of the chicks which hatched in an incubator in the Nursery library. The hatching chicks programme is part of the Early Years Foundation Stage curriculum which aims to give young children a broad range of experiences. The children were able to experience the life of the eight new chicks from their beginnings within the egg, through their struggle to hatch and on to the fluffy, cheeping bundles that develop over the space of a few weeks. They also learned about the needs for survival of the chicks and how to handle them sensitively. The eggs were supplied by Meanwood Valley Urban Farm where the chicks are returned safely after a couple of weeks at school.